SHRI KSHETRA SRIKALAHASTI The Story of Lord Vinayaka's Idol located in the depths of the Suvarnamukhi river bed SHRI KSHETRA SRIKALAHASTI The Story of Lord Vinayaka's Idol located in the depths of the Suvarna - Shiva Maha Purana, Vishnu Purana, garuda purana, bhavishya purana, skanda purana. Sakti is the manifestation of Omkara. In addition, sound is the manifestation of Sakthi. Lord Vinayaka, remover of obstacles, chief of the pramatha ganas, is a manifestation of Sakthi. It is believed that every undertaking, to proceed without obstacles, should begin with the worship of Lord Vinayaka. 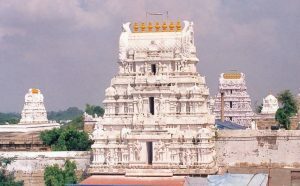 The place where Sri Kanipaka Vinayaka manifested, deep in the underground as self-born, surrounded by sacred water, is located in Chittoor district about 12 km from Chittoor town. Countless are the miracles associated with Lord Vinayaka. Among the numerous legends relating to these, the story of His manifestation deep in the Suvarnamukhi riverbed is one. The legend has it that Suvarnamukhi river dried up once because Sage Agastya did not -worship Lord Vinayaka when he came to Dakshin Kailash. Realising his mistake, the Sage worshipped and obtained Lord Vinayaka’s blessings. As the image of the Lord appeared to be as deep as Hades in the riverbed, the image came to be known as Patala Vinayaka. The sanctum sanctorum for Lord Vinayaka, at a depth of 35 ft below the ground, can be found to be on the left as one proceeds through the northern Gopuram of Sri Kalahsthi temple. It can be reached by descending a flight of 20 steps. We understand from this that we should first obtain the blessings of Lord Vinayaka, eldest son of Lord Siva.